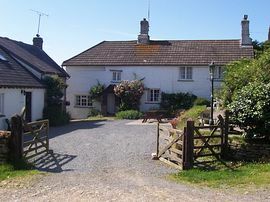 Gooseham Barton is a 50 acre holding situated in the parish of Morwenstow on the N.Cornwall/N.Devon coast, an area of Outstanding Natural Beauty. 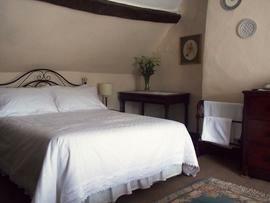 There are 4 cottages to choose from sleeping from 4 to 8 people. 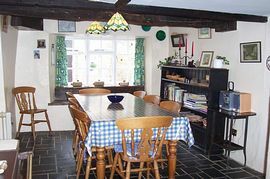 The Farmhouse sleeps 8 in 4 bedrooms, is very well equipped and cosy, has central heating and traditional inglenook fireplace makeing it ideal for out of season getaway breaks. Families or groups of friends are welcome any time of year, as are your pets. Weekend or short breaks are available out of peak times. There are many local attractions in the area from fun parks to historical buildings and gardens, great beaches for swimming and surfing, plus many secluded coves to explore. Nearby are a choice of public houses serving real ales and locally produced food. 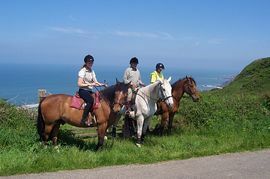 Horse riding is available at our own licenced stables with special discounts offered to our quests, we cater for everyone from the smallest beginner to experienced riders. Half hour lead rein rides on our gentle ponies are very popular with our younger guests. Alternatively you could take a walk in the ancient woods, or along the coastal path with its breathtaking views. Horse Riding for the experienced and novice at our own stables on site. Weekend and midweek breaks available out of peak times. Bed are made up, 1 hand towel and bath towel per person supplied. Up to two well behaved dogs are welcome, other pets please enquire. Ash trays supplied, please consider other guests who will be staying after you. From the M5 Motorway, Junction 27, take the A361 to Barnstaple. Take the A39 towards Bideford and Bude. Cross the new bridge at Bideford, continue towards Bude, passing through the villages of Horns Cross, Fairy Cross and Bucks Cross. Continue straight on at the mini-roundabout and filling station at Clovelly Cross towards Bude. Look out for The West Country Inn on your left (just past Bursdon Moor), continue for approximatley 3 miles, take the right turn signed for Morwenstow. Continue down this road for 2 miles until you reach a sharp left bend immediately prior to a village called SHOP. Turn right on the left bend, signed for Gooseham, we are 1 mile down this lane (it does get narrow) on the left, just past a 'no through road' sign. 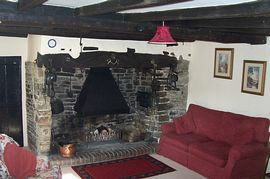 Farmhouse Tariff: Low season £540.00, High season £995. "Our 7th year in the Farmhouse and just as fabulous as ever. Wonderful rides for Chloe and Gary on Dan and Missy which they'll remember for a long time. Managed the round trip (by foot) from Gooseham, along the clifftop path to Morwenstow, and back along the road. Fantastic scenery!! See you again, many thanks." From the Francis clan.